I tore the Nova Scotia Eastern Railway up in the summer of 2004 to get ready for our move to a larger house. Being a good railway baron, I ensured I would have (more) space for a new layout in the new home. 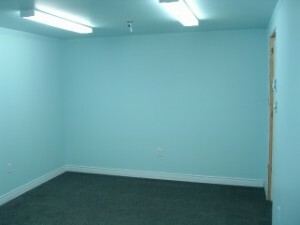 I ended up with a 10×16 foot room, which is about double the area of the NSER. The first trick was to get the room ready. It had four walls, if you could call them that. Two of the walls were the concrete foundation, and the other two were framed but had no electrical work done. There was one heater in the room and one single-bulb light fixture. The floor was concrete and there was no ceiling. Clearly a lot of work needed to be done! 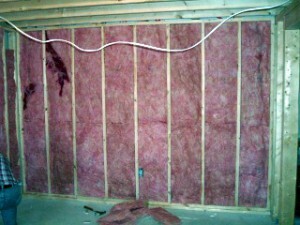 My father-in-law and I put the framing, insulation and wallboard/gyproc up. The ceiling is gyproc as well. 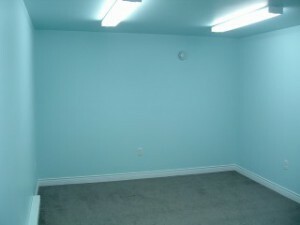 I painted the entire room light blue, including the ceiling. I had a flooring dealer come in to install dark grey carpeting with an underpad, for comfort. 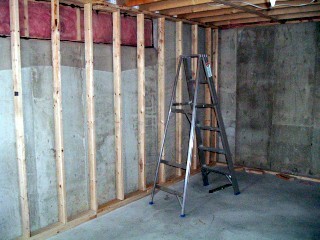 We put in six electrical outlets, two each on the long walls and one centered on each of the short walls. I wanted to have plenty of light, so we put in four two-tube flourescent fixtures on one switch plus provision for a track light on a dimmer. The baseboard heater remains on one of the walls, controlled by a thermostat in the room. There is no telephone connection in the room yet, but I plan on installing one as well as a network port for a future computer. I think the finished product looks pretty good. I’m glad I decided to go with the four light fixtures. It may seem like overkill but I like being able to work without having shadows in the way. I think it will work well when it comes time to take “railfan” photographs. I still haven’t put the track lighting in, but that will come in time. I should mention the two floods we had in the basement. We had a problem with the drain tile around the house, and in the winter of 2005-2006 our basement flooded several times. There were two times in particular where the train room was flooded enough that the carpet became saturated. Both times I had to rip the carpet up and bring in blowers and heat to dry it out, after sucking up whatever water I could with the shop vacuum. Fortunately no model railroad stuff was damaged and the carpet seems to have survived. Even though our flooding problem is fixed, I still don’t leave anything on the floor – just in case.